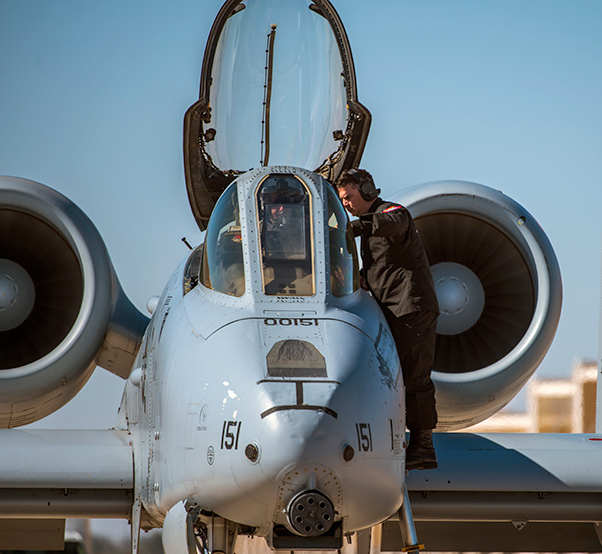 A U.S. Air Force A-10C Thunderbolt II taxies on the flight line in preperation for the 2018 Heritage Flight Training and Certification Course at Davis-Monthan Air Force Base, Ariz., Feb. 27, 2018. The HFTCC provides civilian and military pilots the opportunity to practice flying in formation together in preparation for future air shows. 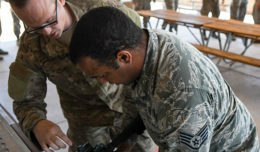 Davis-Monthan Air Force Base in Arizona is hosting the 21st annual Heritage Flight Training and Certification Course March 1-4, 2018. 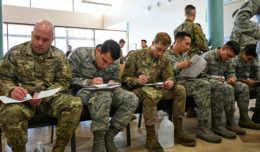 Established in 1997, the HFTCC certifies civilian pilots of historic aircraft and U.S. Air Force pilots to fly in formation together during the upcoming air show season. 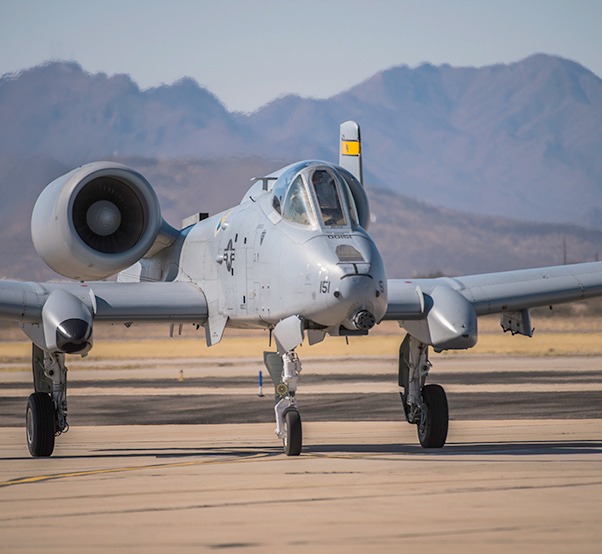 The A-10C Thunderbolt II Demonstration Team along with the F-35 Lightning II, F-22 Raptor and the F-16 Fighting Falcon demo teams will be flying in this year’s certification course. These modern fighter aircraft will fly alongside historic aircraft to include the P-51 Mustang, P-40 Warhawk, the P-38 Lightning and F-86 Sabre. 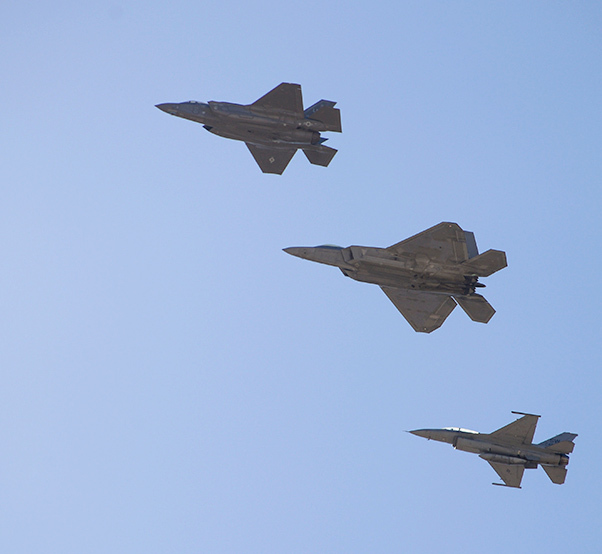 A U.S. Air Force F-35 Lightning II, F-22 Raptor and F-16 Fighting Falcon perform a flyover in preparation for the Heritage Flight Training and Certification Course at Davis-Monthan Air Force Base, Ariz.., Feb. 27, 2018. The course will feature aerial demonstrations from historical and modern fighter aircraft. Flying alongside the historic aircraft gives pilots a better perspective on the stark differences that pilots faced flying in previous generations. 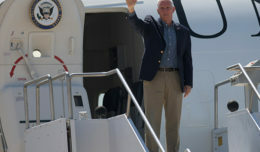 “I’m provided the unique opportunity to see up close the challenges and differences our military faced in World War 2 and Vietnam era aircraft,” said Capt. Cody Wilton, A-10C Thunderbolt II Demonstration Team pilot. 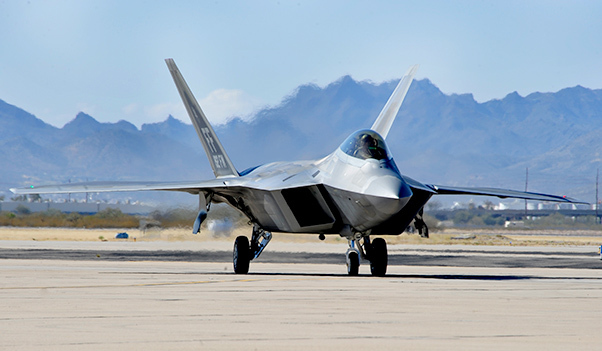 Additionally, HFTCC highlights the rapid development in technology, and how it has effected the Air Force’s fleet. The ramp will be open to those with base access March 2-4. A U.S. Air Force F-35 Lightning II taxies on the flight line at Davis-Monthan Air Force Base, Ariz., Feb. 27, 2018. The F-35 Demonstration Team will be participating in the 2018 Heritage Flight Training and Certification Course. The HFTCC is intended to certify pilots of both modern and historic aircraft to fly in formation together during the upcoming airshow season. A U.S. Air Force F-16 Fighting Falcon taxies on the flight line at Davis-Monthan Air Force Base, Ariz., Feb. 27, 2018. The F-16 Viper Demonstration Team will be participating in this year’s Heritage Flight Training and Certification Course. 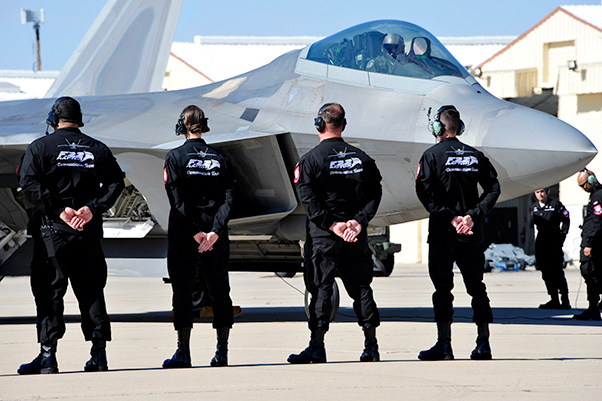 The U.S. Air Force F-35 Demonstration Team stands in formation together while the F-35 Lightning II pilot prepares to exit the aircraft at Davis-Monthan Air Force Base, Ariz., Feb. 27, 2018. 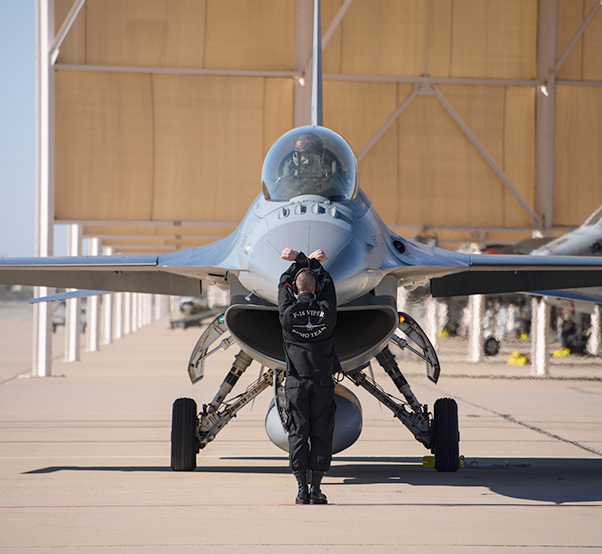 A member of the U.S. Air Force F-16 Viper Demonstration Team parks and F-16 Fighting Falcon on the flight line in preparation for the Heritage Flight Training and Certification Course at Davis-Monthan Air Force Base, Ariz., Feb. 27, 2018.